– Trinidad And Tobago’s 400H world champ Jehue Gordon talking about competing against his idols at the 2009 Berlin World Championships as a 17-year-old. 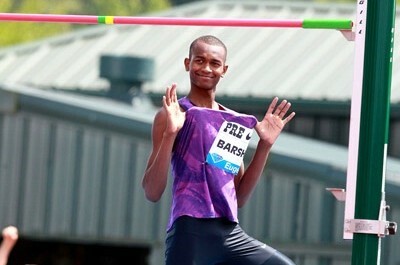 He finished fourth in a then-national record 48.26, just 0.03 outside of a medal. Has anyone ever had better range than Curtis Beach? Must Read: ProPublica Investigation Alleges Anti-Doping Violations By Alberto Salazar David Epstein’s been working on this piece for a few years. A great read alleging possible anti-doping violations by Alberto Salazar and even Galen Rupp. 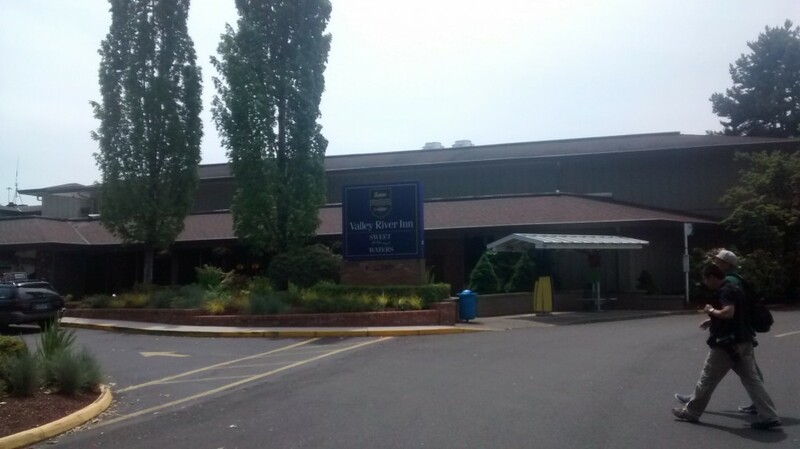 LRC Rojo’s Five Quick Thoughts On David Epstein’s Nike Oregon Project Investigation David Epstein‘s piece is a great read, this could be just the beginning as it is time for more people to speak on the record and for Nike to investigate its own house. Plus Matt Centrowitz‘s tweet on this is embarrassing. What a week. 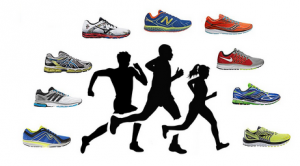 We give you "10 People That Had A Good Week" and the list includes Jeff Galloway, Meb Keflezighi, Ben True, Stephanie Garcia, Mo Aman, Anastasiya Bazdyreva, Kyle Merber, Mo Farah, Emily Chebet and Mary Cain. Yes, Mary Cain. Plus we break down the winners and losers from the NCAA Regionals, mourn the loss of "blue-collar" running legend Pat Petersen, and explain to you why Alexa Efraimson has zero shot at the World Junior record. Iceland’s Anita Hinriksdottir Hoping To Finally Break The 2-Minute 800 Barrier Today At The Games Of Small States Meet The 19-year-old has a PR of 2:00.49 which she ran 2 years ago. 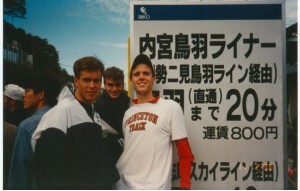 Q&A With Track Writer Jack Welch About The State Of US Running And What It Was Like Interviewing And Reporting On The All-Time Greats In The Sport Welch is the author of “When Running Was Young And So Were We” and co-founded “Running” magazine. RIP: Former US Marathon Record Holder Pat Petersen Dies From Cancer At Age 55 Petersen had a PR of 2:10:04 (a loop-course AR at the time) and finished top 5 in the NYC Marathon three times. 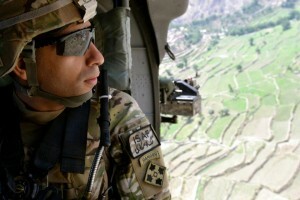 *MB: R.I.P. Pat Petersen Petersen left behind a wife and four children who are in a difficult financial situation. You can help them by contributing here. First Asian-Born Sprinter To Go Under The 10-Second Mark Will Skip The Open 100 To Focus On Relay At Asian Champs Su Bingtian will concentrate on China’s 4 x 100. Brit Adam Gemili’s Sub-10 Seconds 100m Spoiled By Wind Assistance He ran 9.97 with a 3.7 m/s tailwind. 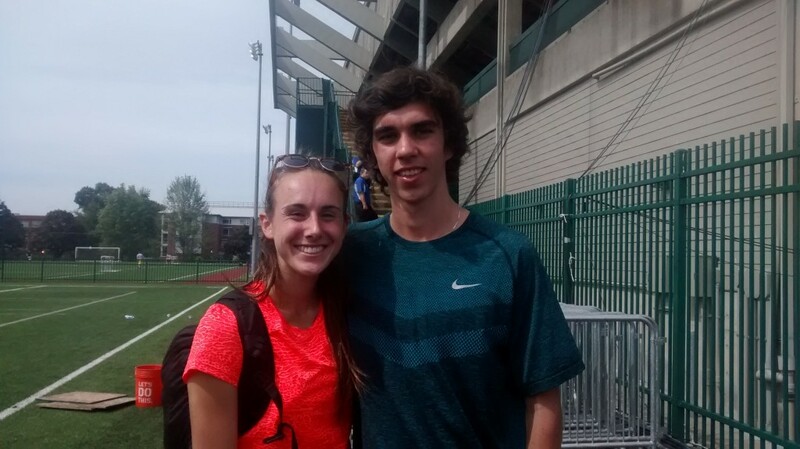 Alexa Efraimson has displaced Mary Cain as the queen of American high school running and she's the prom date of sub-4 miler Matthew Maton. China’s Su Bingtian Became The First Asian-Born Athlete To Run Sub-10 In The 100 He ran 9.99 to get 3rd at Pre. English Gardner Back On Track Again After Setting A PR And Winning The (“B”) 100 At Pre The Oregon alum had struggled in 2014 with injury and poor racing, but got a familiar win at Hayward Field on Saturday running 10.84. 2. Alexa Effraimson is now faster than Mary Cain has been! 4:03!!! 4. Pre 2015: NOP TROUNCED on home field. Can we accept the “project” has failed? 7. Pre Classic preempted by Children’s Hospital telethon in New Orleans. It also wasn’t shown in Detroit. 9. Anyone else disappointed in Kemboi’s victory dance? IAAF Report Gotzis Hypo Meeting: Brianne Theisen Eaton And Germany’s Kai Kazmirek Lead After First Day Ashton Eaton was a late withdrawal due to a back injury sustained in training. 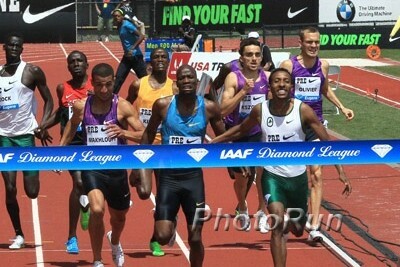 Wejo wraps up his thoughts from Eugene about Pre. LRCRome Preview: A Totally Loaded Men's 5,000, Aman Vs. Amos Round II, And Can Jenny Simpson Take Down Dawit Seyaum And Win Her Fourth Straight 1,500 On The Diamond League Circuit? 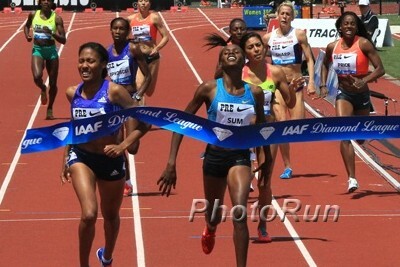 Simpson is the reigning DL champ but she's never beaten Ethiopian teen sensation Dawit Seyaum. 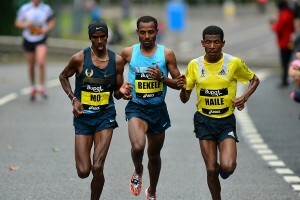 In the 5,000, Pre winner Yomif Kejelcha faces Doha 3k winner Hagos Gebrhiwet and a ton of other fast guys (six men sub-13:00). Plus Justin Gatlin in the 100, Renaud Lavillenie in the pole vault and Jasmin Stowers in the 100 hurdles. David Oliver Fires His Longtime Coach Brooks Johnson Over Profanity-Filled Text Message He Sent After Pre Classic Johnson has been a legend in the sport for decades, but Oliver explains why the disrespectful text message was the last straw. *MB: DAVID OLIVER FIRES HIS COACH RESPECTFULLY!!!!!! Bruce Jenner Reveals How He Chose Caitlyn As His New Name One way she attempted to come up with ideas was by watching the Miss America pageant. IAAF Inside Athletics Interview With Trinidad And Tobago 400H World Champ Jehue Gordon Gordon talks about competing at the 2009 World Championships as a 17-year-old and not wanting to show “any fear” even though he was up against his idols. IAAF Personal Bests Q&A With Olympic LJ Silver Medalist Will Claye He says Tony McQuay and Erik Kynard are like his brothers and Christian Taylor is his greatest rival. Sprinter Dina Asher-Smith Leads Team GB & NI For European Team Championships Later This Month NCAA XC champ Kate Avery is on the team in the 3,000. Scottish Athletics To Receive 5.75 Million Dollars In Funding From Sport Scotland Over The Next 4 Years Less than they got the last Olympic cycle, but still the second-highest funded sport behind swimming. 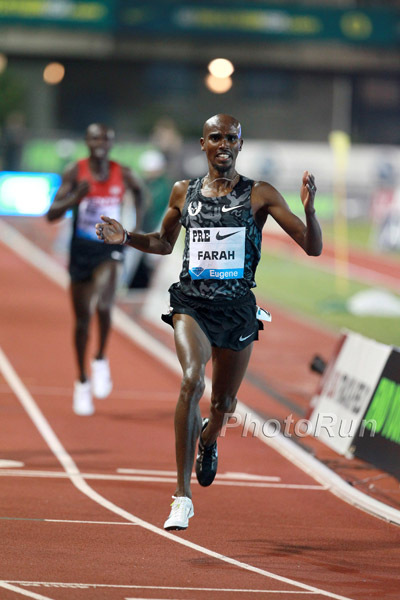 The fast race Farah wanted did not materialize, but he showed he still is the boss and afterwards said Galen Rupp will win an Olympic gold medal and is his #1 rival at 10,000m. 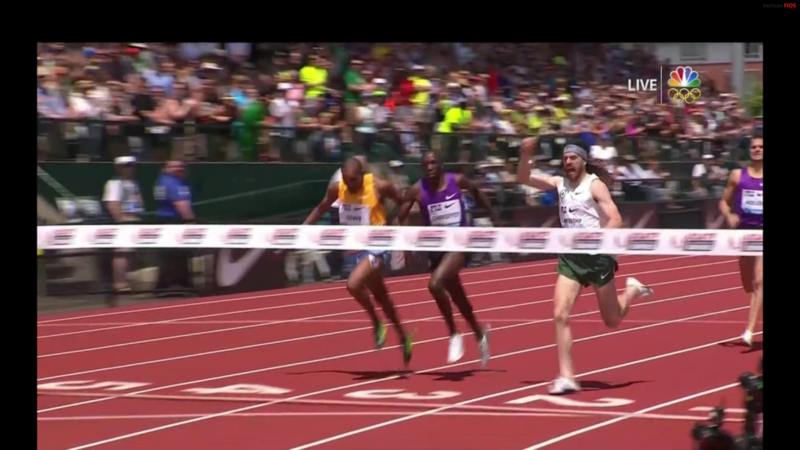 Kejelcha arrived, Galen Rupp had a nice opener, and Bernard Lagat set another record. Brianne Theisen-Eaton And Germany’s Kai Kazmirek Win Heptathlon And Decathlon At Gotzis Hypo-Meeting Theisen-Eaton won the prestigious meet for the second time in her career with a new NR of 6,531. The Netherlands’ Dafne Schippers was on her way to a runner-up finish, but pulled out with a knee injury. With Ashton Eaton withdrawing with injury, Kazmirek won with 8,462 points. Olympic Champ Jessica Ennis Ecstatic To Finish 4th In Her First Heptathlon Since The Olympics She scored 6,520 points which got her the qualifying standard for Rio 2016. BBC Asks How Good Was Jessica Ennis’ 4th Place Finish And Can She Get Back On Top? Recommended Read: Grantland.com: Forty Years After Pre’s Death, His Life Continues To Affect Athletes Everywhere – And His Loss Haunts Those At Home A lengthy piece on the life, career and death of Prefontaine. A lot of info you won’t have known from watching the movies, including the debate about whether he was drunk (and if the accident was his fault) the night he died. Vin Lananna Says Hayward Field Renovations For 2021 Worlds Will Be Completed By 2018 Eugene plans on bidding to host the Olympic Trials again in 2020. We say give someone else a chance. Track Stars Talk About How Great 2021 Worlds In Eugene Will Be Quotes from Jenny Simpson, Sanya Richards-Ross, Allyson Felix and Kirani James. 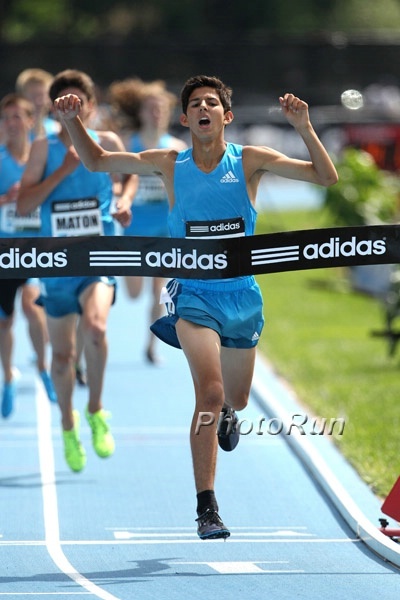 Thursday: Grant Fisher Going For Sub-4 At Festival Of Miles Thursday Night In St. Louis Fisher will be in a field of pros including Jordan McNamara, Jack Bolas and Aaron Braun. 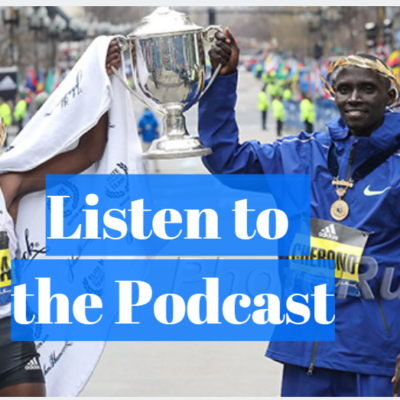 Recommended Read: Jenny Simpson Writes About Being Her Husband’s Lead Cheerleader When He Trained For And Ran In The Boston Marathon Jenny says even though she’s the pro runner, Jason was running more miles and putting in harder workouts. He ended up running a PR of 2:25:47 in cold and windy conditions. MileSplit Asks: Did Alexa Efraimson Really Break A National High School Record? They say it’s not a record because she is a pro. 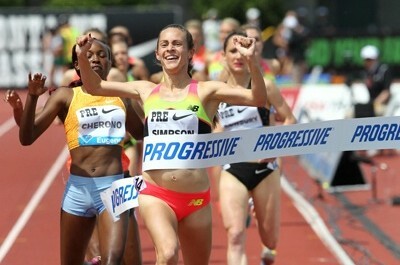 Track and Field News says the same and that they will leave Mary Cain‘s 4:04.62 mark as the record. 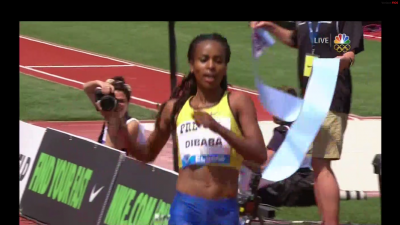 When Cain ran that she was not running for her high school team, was being coached by Alberto Salazar and flying around the country racing in pro meets. She just wasn’t getting paid and Efraimson is. Oregon’s NCAA 110H Champ Devon Allen Got Stuck In An Elevator And Comically Live Tweeted It His posts went on for the hour+ he was stuck in there. Former Princeton Ivy League Champ Is “Racing For A Rose” On “The Bachelorette” Ian Thomson was struck by a car going 60mph shortly after he graduated and doctors said he would never run again, but he’s fought back to the point he can do 15 miles per week. 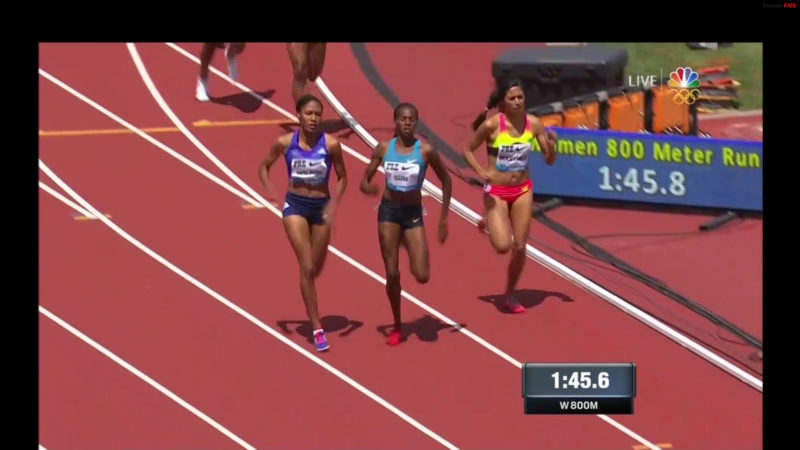 LRC A Massive Day For Americans At 1,500/Mile At Pre – Jenny Simpson Wins, Centro Is 2nd And High Schooler Alexa Efraimson Runs 4:03.39 Simpson (4:00.98) won her third straight DL race while Centro missed out on the win by .10 as Ayanleh Souleiman repeated in the Bowerman Mile (3:51.10). Efraimson broke Mary Cain‘s HS/U.S. 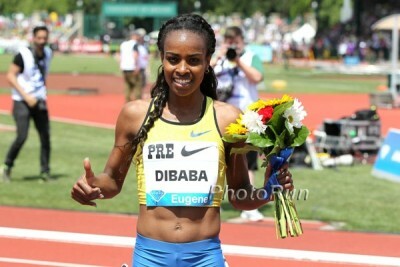 Junior record by running 4:03.39. LRC 800s Worlds Preview? Eunice Sum Beats Ajee Wilson In A Nail Biter As Mo Aman Gets It Done In Front Of His New Hometown Crowd Ajee Wilson keeps progressing and Aman returned to form. 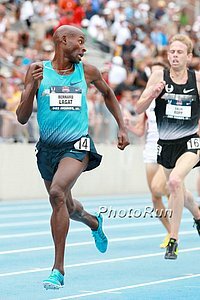 LRC Rest Of Meet: Genzebe Dibaba (14:19.76) Misses WR But Gets Dominant Win, Ezekiel Kemboi Is Back And Evan Jager Impresses Kemboi (8:01.71) outkicked Jairus Birech (8:01.83) as Jager was 4th in 8:05.28, his fastest-ever opener. Justin Gatlin kept winning with a world-leading 19.68 in the 200 while Mutaz Essa Barshim cleared 2.41 but chose not to go any higher even though he had no misses in the competition. Meb Keflezighi Wins USATF Masters Title At Suja Rock ‘N’ Roll Half Marathon In his first race as a master, Meb set the half WR at 62:29 although the race was actually won by Jordan Chipangama in 62:27. Eri Hayakawa won the women’s half (1:10:50) while Sara Hall was 3rd (1:11:31) and Jen Rhines won the masters race (1:16:36). RunBlogRun Piece On Meb: “A Road Warrior Looks At Forty” This article says Meb’s time won’t count as the WR because there is too great an elevation drop, although he should get the 15K and 10-mile records. 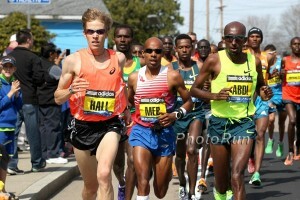 *MB: Americans at Comrades Sage Canaday was 15th; Max King was 11 with only 17K to go, but faded to 50th. A Hard Way To Run 2:19: Peter Wanjiru (2:19:34) And Joan Kigen (2:39:43) Win Edinburgh Marathon Apparently Wanjiru went through the half in 1:05:01 and then was just the one who died least on a windy day. MB: LRC tells you which guys and gals seeded in the top 10 in the mid-d/distance events didn’t make it to Eugene. USTFCCCA Inside The Numbers Of The Qualifying Athletes For 2015 NCAA Champs Oregon men and women and the SEC conference all have the most qualifiers. MB: Who was your biggest surprise to be left home in the 10k? GB Goes Sub-10: GB’s Adam Gemili Wins 100 In 10.13 At Bedford International Games He actually ended up running 9.97 in the final, but had a huge 3.7 m/s tailwind. Other winners included Jodie Williams (400 – 53.51), Jack Green (400H – 50.39), Isobel Pooley (HJ – 1.91m) and Robbie Grabartz (HJ – 2.24m). Kyle Merber Wins Furman Elite 1,500m In 3:34.54; Stephanie Garcia Runs 4:05.39 Merber’s previous best was the 3:35.59 he ran in 2012. It was a huge PR for Garcia, who had only run 4:13.33. Cory Leslie (3:35.36) and Stephanie Brown (4:07.55) were the runner-ups. Grant Fisher Takes Another Shot At Sub-4 But Comes Up Short One race had two separate finish lines as he won the 1,600m in 4:00.28, but continued on for a mile in 4:01.66. 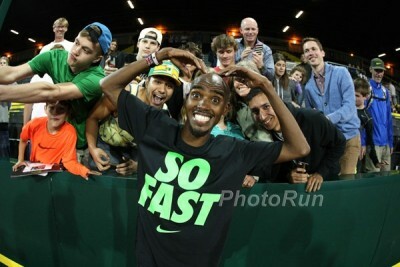 He’ll have another shot at the adidas Dream Mile in a couple of weeks. USATF Headline: “Tianna Bartoletta And Joe Kovacs Steal The Show On Pre Classic ‘Distance Night'” Bartoletta won the LJ and Kovacs the SP. 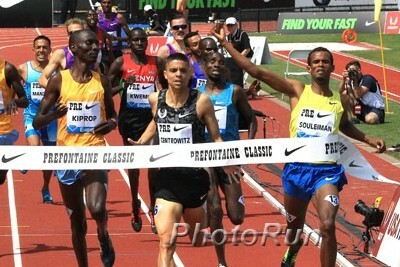 CAM LEVINS.. what can you say? 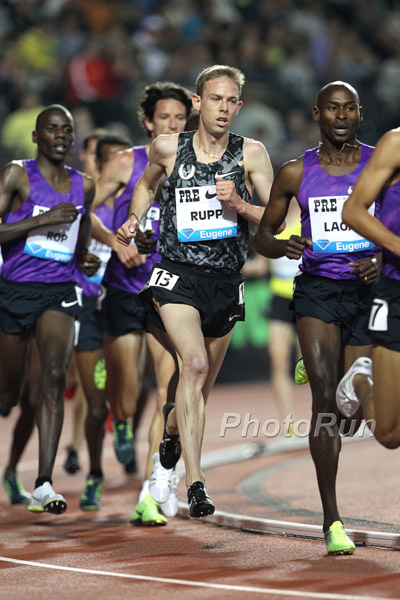 Why can’t Rupp kick in a 5k? LRC Justin Gatlin Does Not Want To Talk About His Drug Past And Things Get A Little Testy With LRC’s Wejo Justin Gatlin has no interest in talking about his past drug suspension.